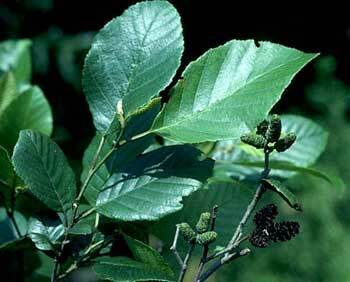 Smooth alder (A. serrulata), the hazel alder, is a shrub or tree growing to 15 feet; with blackish bark that is lightly speckled with small, grayish to orange lenticels. Its leaves are elliptic to obovate (wedged-shaped), finely serrate and usually fine-haired underneath, broadest above the middle. Male catkins abruptly bent. Flowers (catkins) February to May. Cones are woody, erect, persistent. It can be found from Nova Scotia to Oklahoma, Florida, and Louisiana. Native Americans used the bark tea for diarrhea, pain of childbirth, coughs, toothaches, sore mouth, and as a blood purifier, a laxative. Externally, as an eye wash, a wash for hives, poison-ivy rash, piles, swellings, and sprains. Used in the 1800’s for malaria and syphilis.